During their meeting Anne was speaking to the sisters about this mission and spoke about the messages and the writings. Anne then began to tell the sisters about her experience with the Lord and most recently with St. Faustina herself. When she mentioned that her mission was to spread the message of Jesus Christ the Returning King, the Mother Superior told her about something very strange that had happened to her the day before. She explained that on her feast day an artist friend of hers had presented her with a painting, which he had told Mother Superior would be a painting of her patron saint. However, when he gave her the painting, he explained it was a painting of Christ the King. She immediately went off to fetch the painting and then everyone saw it, everyone in the room were amazed and recognized that this painting was to be the authentic image for the apostolate representing Jesus Christ the Returning King. The Mother Superior immediately presented the painting to Anne telling her she was certain that it was really meant for Anne. The artist of this painting, Janusz Antosz explains that before he began this painting he experienced a long period of pain and suffering. From beginning to end it took him over a year to complete the painting. Janusz stated clearly that this painting is the pearl of his entire body of work. He explained that it is a painting from a technical standpoint, but has many aspects of an icon. The painting blends the Western European painting style with the style of icons from the East. He wanted the painting to have the look of both, so as to include all of the Catholic Church(Eastern and Latin) as well as other Christian Orthodox. It is a merging of styles that represents a hope for Christian unity. According to Janusz, it shows our Lord’s longing “that they may be one, as We are one” (John 17:22). As a whole, the painting is meant to reflect the glory of heaven. He explains how at the bottom of the painting the two individuals represent the Eastern and Western saints. The Eastern saint is the hooded individual and the other, a Western saint. In the painting they both adore the Lord which represents that all believers, from East to West, will adore the Lord. The flowers along the arch at the top of the painting, which are bell shaped, symbolize the good news of a beginning, or in other words, an announcement of a coming. For example, at the beginning of Mass, the bells are rung and the priest enters the sanctuary. In this case, it is the High priest entering. Further, the gold area directly below the arch represents the glory and reality of heaven. In regards to Our Lord’s vestments and the color of the vestments, this is important. Our Lord is dressed as a bishop/priest and the colors are those traditionally used to portray sacrifice as well as glory and praise. The pattern on the vestments is consistent with patterns found in icons, while the color of the alb is blue. The Lord’s face is modeled after the Shroud of Turin, while his hand is the gesture of a blessing and also means “I love you” in sign language. Additionally the scepter with the cross at the top represents that through the power of the cross, all power rests with the Lord “All authority in heaven and on earth has been given to Me” (Matt 28:18) This also confirms His kingship – “The King of kings and the Lord of lords.” (1 Tim 6:15) Which is reflected by the crown on His head. Around his halo are symbols: the letter N is Greek for “I am.” These words are taken from the book of Exodus 3:14, when Moses asks God for His name. According to an expert on icons, O and N are symbols of the presence of God and the mystery of the incarnation – the divine presence becomes visible in the New Covenant when, after having received a body by being born of the Virgin Mary, He appears to us so that we may adore Him as God, who is love. Janusz describes his inspiration for Jesus’s throne is in a style from the 17th century Baroque period. The light, bright colors represent Christ the King’s purity, beauty and holiness. On the top of the throne, Janusz goes on to explain that these are lily flowers closest to Our Lord and represent His purity. As well, the angels are Seraphim angels- the angels present at God’s throne who constantly praise Him (Isaiah 6:1-7). Around the neck of Jesus is a medal with a cross on it, this cross is directly over Our Lord’s Sacred Heart. It is meant to show that by dying on the cross, He shows the love He has for each one of us. You will also see on the painting the flowers directly to the left and right of Jesus; they are wide open and facing the Lord, meaning they are praising and giving great glory to the Lord. Near there are the grapes and the wheat which represent the Holy Eucharist. You will also notice an open area between the two groups of flowers. Janusz said that he wanted to convey that by prayer and meditation we will have no obstruction on the journey to Christ. We will all have a direct path or an open road to the Lord and we will gain a more intimate relationship and closer union with Him. The last thing to mention is that on the top of the painting there are gold leaves. These leaves are leaves of a vine, indicating that Jesus is the vine (John 15:1). The leaves are open and giving glory to Our Lord. They are also positioned to showcase Our Lord. 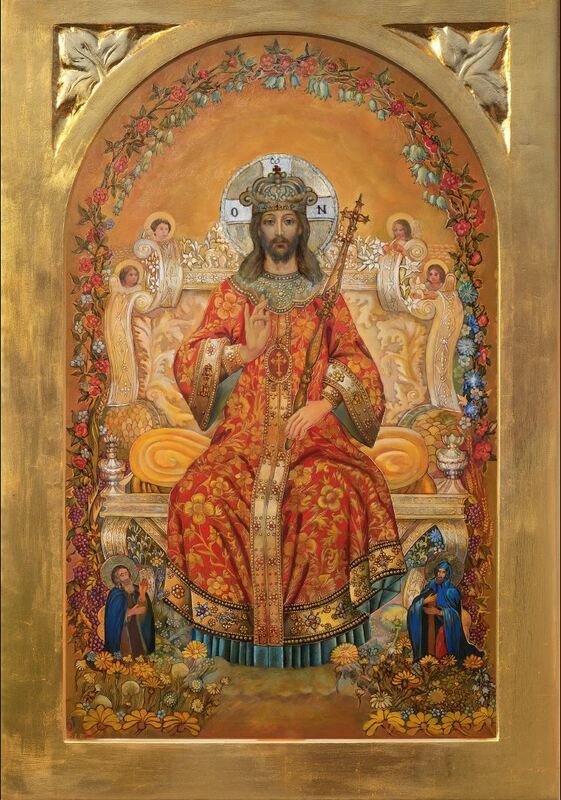 You can purchase prints of the image of Jesus Christ the Returning King here. 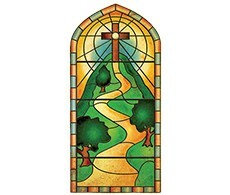 Direction for Our Times also offers custom-framed images of Jesus Christ the Returning King. Please email us at contactus@directionforourtimes.org for more infomarion. A visit with artist Janusz Antosz from dfotmedia on Vimeo. Who are the two individuals at the bottom of painting? There is not any one particular saint associated to these saints. The individuals represent Eastern and Western saints. The Eastern saint is the hooded individual and the other, a Western saint. In the painting, they both adore the Lord which represents that all believers, from East to West, will adore the Lord. Please describe the flowers along the arch at the top of the painting. The flowers, which are shaped as bells, symboli7.e the good news of a beginning, or in other words, an announcement of a coming. For example, at the beginning of Mass, the bells are ringing and the priest enter the sanctuary. In this case, it is the High Priest entering. What about the gold area below the arch? The gold area represents the glory and reality of heaven. Is there any significance to Our Lord’s vestments and the color of the vestments? Our Lord is dressed as a bishop/priest and the colors are those traditionally used to portray sacrifice as well as glory and praise. The pattern on the vestments is consistent with patterns found in icons. The color of the alb is blue. How did you decide to portray Our Lord’s face? I modeled Our Lord’s face after the Shroud of Turin. Our Lord’s hand is raised in blessing. Did you know the hand gesture of Our Lord in the painting, in sign language, says “I REALLY LOVE YOU”? additional meaning in sign language. What does the scepter with the cross at the top represent? The scepter represents that through the power of the cross, all power rests with the Lord. •All authority in heaven and on earth has been give to Me• (Matt 28: 18). And the crown on His head? His crown reflects His kingship – “The King of kings and the Lord of lords.” (11im 6:15). What about His halo and the letters around His halo? The lettcr around his halo arc actually symbols: the letter 0 is Omega, and the letter Nu Greek fur “I am”. These words are taken from the book of Exodus 3: 14, when Moses asks God for His Name. According to an expert on icons, 0 and N a.re symbols of the presence of God and the mystery of the Incarnation – the divine presence becomes visible. Also, in this icon, it reflects the mystery of the coming of Our Lord. The invisible God of the Old Covenant becomes visible in the New Covenant when, after having received a body by being born of the Virgin Mary, He appears to us so that we may adore Him as God, who is love. What was your inspiration for His throne? The throne is in a style from the 17th century Baroque period. The light, bright colors represent Christ the King’s purity, beauty and holiness. I am trying to convey that the environment around Jesus is very bright and beautiful. What about the white lilies on the top of His throne? What type of angels are in the painting? These angels are Seraphim angels – the angels present at God’s throne who constantly praise Him (Isaiah 6:1-7). Is there anything special about the medal around His neck? for each one of us. In most of the icons I have seen, the med.all.ion docs not have any type of image in it. I felt it appropriate to add the cross for this symbolism. Please tell me about the flowers directly to the left and the right of his throne. These flowers arc wide open and facing the Lord, meaning they arc praising and giving great glory to the Lord. And the grapes and wheat? The grapes and wheat represent the Holy Eucharist. What about the two groups of flowers in the bottom corners? These flowers arc natural flowers wide open facing toward Jesus giving Him glory. Is there anything special about the open area between the two groups of flowers? By painting this open area, I wanted to convey that through prayer and meditation, we will not have any obstruction on the journey to Christ. We will all have a direct path or an open road to the Lord and we will gain a more intimate relationship and closer union with Him. Is there anything significant about the gold leaves in the top corners? These leaves are leaves of a vine, indicating that Jesus is the vine (John 15:1). The leaves are open and giving glory to Our Lord. They are also positioned to showcase Our Lord.